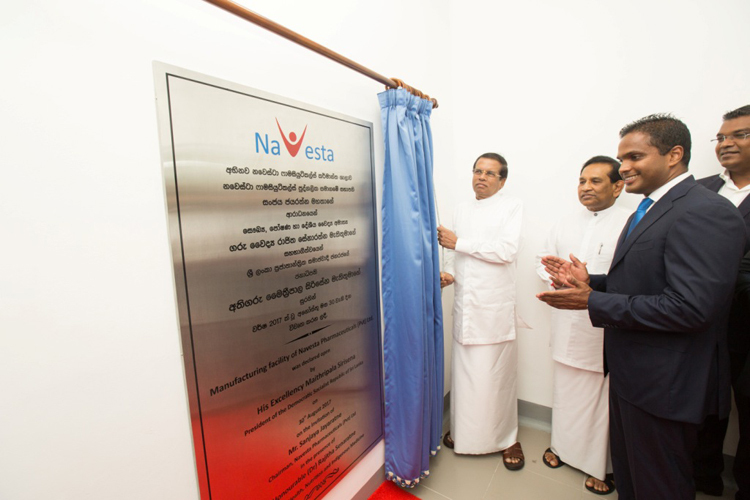 Navesta Pharmaceuticals Private Limited has set the benchmark for the local pharmaceutical manufacturing sector by opening the Country’s first sterile pharmaceutical manufacturing plant in Horana. Navesta Pharmaceuticals is Sri Lanka’s first European Union Good Manufacturing Practices (EU-GMP) and Pharmaceutical Inspection Co-Operation Scheme (PIC/S), compliant facility which will enable the Company to export their products to most global markets that accepts these accreditations. Additionally, the facility is also equipped with the Country’s first EU-GMP compliant A and B Grade Microbiology (MB) laboratory, capable of carrying out comprehensive, advanced in-house testing methodologies. Navesta Pharmaceuticals will primarily meet the local demand of 12 products in the Penicillin category (antibiotic drugs that are a part of the Beta Lactam group of medicines) dry powder injectable that were previously imported to the Country. The plant was formally declared open by the Chief Guest, His Excellency the President Maithripala Sirisena on 30th August 2017. The Guest of Honour at the inauguration was the Minister of Health, Nutrition and Indigenous Medicine, Honourable Dr. Rajitha Seneratne. In addition, a host of other distinguished guests graced the occasion. Navesta’s 40,000 square foot manufacturing facility has a capacity to produce 50 million vials, saving millions in foreign expenditure for the Country. Navesta Pharmaceuticals will expand the facility in the coming years to increase its production capacity by three-fold and contribute significantly to the Sri Lankan economy with exports. With the set-up of this facility, over 100 direct employment opportunities were created to include local graduates from chemistry, engineering, finance and pharmaceutical studies, while over 500 indirect employment opportunities were created through local home industries and ancillary services. In order to comply with EU-GMP and PIC/S standards, an advanced Building Management System (BMS) is utilised to regulate temperature, humidity as well as differential pressure in critical production and product testing areas. This highly regulated environment ensures that the drugs manufactured at the factory are free of all viable micro-organisms (contaminant free). Sri Lanka’s first Clean Room Panels (fabricated partitions made with pre-coated galvanized iron) protects the interior of the facility from further external contaminants. Striving to become an environmentally friendly sustainable business, Navesta facility is committed to utilizing energy efficient lighting as well as a comprehensive waste water treatment process. Navesta’s manufacturing facility houses 13 incubator chambers and 2 walk-in incubators which are Sri Lanka’s first 21 Code of Federal Regulations (CFR) compliant equipment sets. All test and measuring instruments that are used within the facility are calibrated up-to-date, from local and foreign agencies with ISO 17025 or ISO 9001 accreditations. In 2015, the Government of Sri Lanka enacted the new National Medicinal Drugs Policy which encouraged more local companies to explore the opportunity of manufacturing pharmaceutical products, to drive Sri Lanka towards the vision of becoming self-sufficient in pharmaceuticals by 2020. Acting on this directive, Navesta Pharmaceuticals ventured into a BOI (Board of Investments of Sri Lanka) approved investment of Rs 1.4 billion to construct and implement the first ever sterile pharmaceutical manufacturing facility in Sri Lanka.